This entry was posted in Gardens, Reading, Uncategorized, Writing notes and tagged Amy Green drawings, Drawings, Lowfell Writer's Place, Suzy Henderson, Tree peony by hilarycustancegreen. Bookmark the permalink. I love the display, perfect place, and perfect background. I am thinking of painting a wall green! 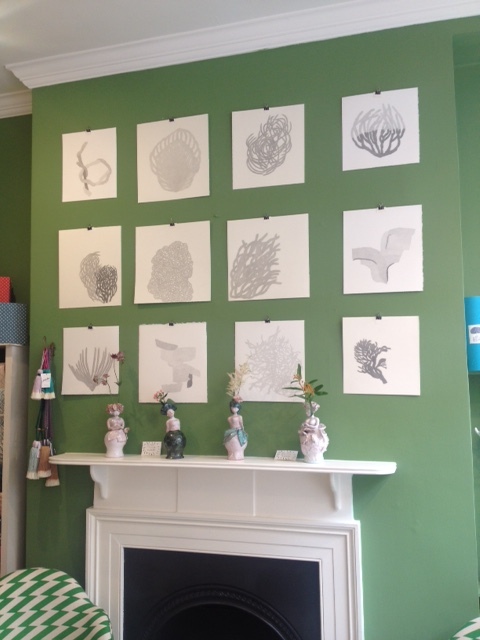 We have several of Amy’s drawings and they work well grouped and against a dark ground. Go for it…it looks great. Lovely drawings from your daughter! Is everyone in your family artistic in their talents? My mother was a great storyteller and writer, and here I am, also a writer. Our parents influence us, sometimes in ways that only become clear later. That peony tree looks as colourful and pretty as some flowers. Amy’s talent comes from outer space, neither I nor my husband have her delicacy of touch or her astonishing concentration and patience. My parents gave me a love of reading and the music of words, I hope we have passed something useful on to ours. Interesting, I had not made the connection with thoughtfulness or directly with meditation, which Amy practices, though the drawings came years before she became interested in that. Perhaps you could post some of yours one day? I went through a phase of “meditation” as a zen- like sitting exercise before I ever took up drawing in a serious way. Frederick Franck’s “The Awakened Eye” and “Zen Drawing, Zen Seeing” were revelatory to me, in the sense that he made a good case for the belief that a more “active” meditation than sitting meditation was quite appropriate to the “western” mind. Thus a kind of extremely mindful drawing. Mindfulness in each ordinary activity of the day became for me a more important practice than setting aside a separate thing called “meditation.” The drawing practice spills over into life. The drawings don’t feel like anything I would want to post online, but it’s something to think about. Thanks, Hilary. I like this very much. I have been meditating now (just me and a computer app) for a couple of years, but I do try and apply in life. I think Amy is naturally mindful – it makes being in her company very restful and pleasurable. Those drawings are just great, and are perfectly placed on this great colored wall. Thank you, I’m very happy to take praise on my daughter’s behalf. Great drawings and so simply put. One could also not improve on the tree peony. A joy to look at. Thank you, yes, her drawings have an immensely calming effect. 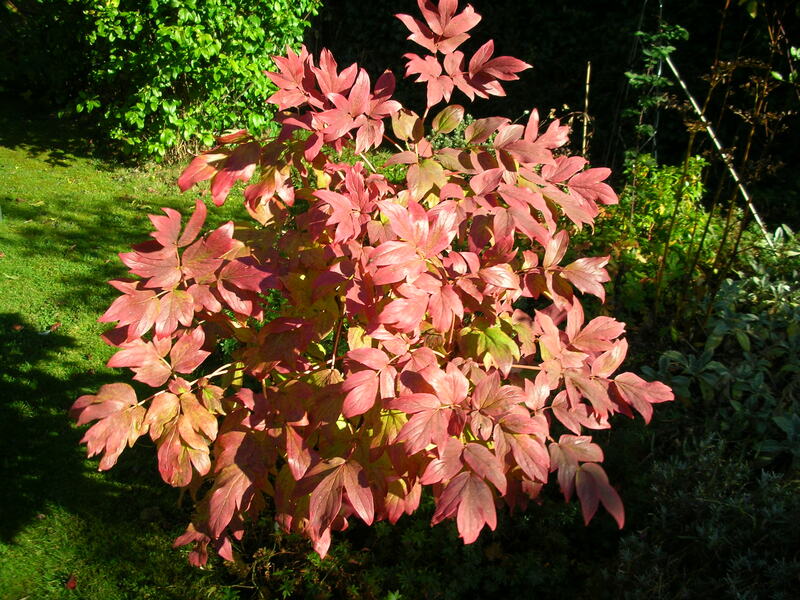 I love the peony in its autumn dress, though it is being thoroughly outshone by the Japanese maples at the moment. Checked out the Tatler shot – Amy has made it to the society pages! Liked the drawings. So funny, the guy she is talking to is a well-known sports reporter… who was at sixth-form college with her older sister. I gather Hugh Grant was there too. Molte grazie. My Italian is very rusty (though I listen to a lot of opera) and love the language. Hilary, your daughter Amy’s drawings are amazing; delicate and precise looking (from my view, though my vision’s not the best, they are corals and other sea life). It is calming to look at them, and the background choice of light green is superb. My congratulations to her! Thanks for the updates, photos, and links, too. Corals and sea life? I think that is very perceptive and I have never seen them that way! I have watched them evolve over many years so forgot to look at them with new eyes. Thanks. Can I say oops? Yes, that was my interpretation, and that’s from an initial viewing, alas, not in-person so I can get a closer look. They look soft and organic to me, calming and somehow comfortable in just being (call it instinct, call it nature, call it whatever). That’s me, though. Again, they are wow-worthy. Were I rich, I’d buy them up! Thank you for liking them so much. Don’t say oops. I think you are spot-on. I don’t think Amy was knowingly thinking corals and sea life, but they grow organically in a way that is very similar. They have exactly the same effect on me. We’ve been buying (and being given them) for many years. They aren’t crazy expensive. Well done. And love the tree peony. I didn’t think tree peonies looked like that. I think I was misidentifying another plant. Thanks. There are lots of different kinds of tree peony. Some only look pretty in flower and some are all leaf and no flower… and some, like this one are pretty for 9 months of the year (but not so good the other three). Green is very restful. Thanks so much. 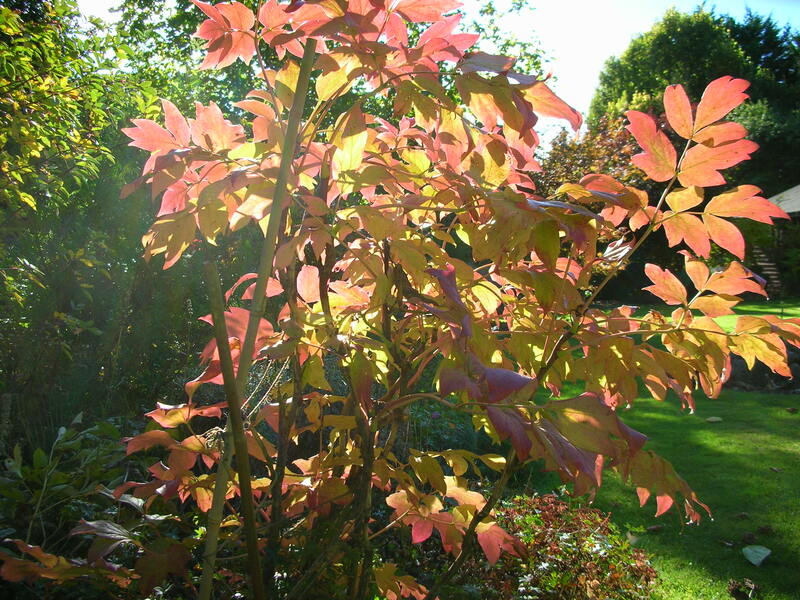 We are lucky and as the sun starts its autumn trajectory, we get some lovely light in the garden. Loved reading about Amy and great picture in Tatler 😊. Lovely pictures my Mum has a deep red wall they would look good on too. You are right, they look very good on terracotta too – Amy painted her room that colour when she was about twelve.